The Lewabrane RO B400 HP and Lewabrane RO B440 HP elements include enhanced brackish water processing capabilities. 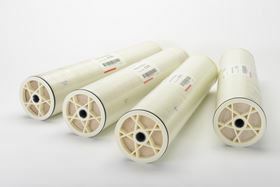 LANXESS’ Liquid Purification Technologies’ business unit will be introducing its new Lewabrane high performance (HP) membranes at the 2019 Membrane Technology Conference & Exposition (MTC), which takes place in New Orleans from 26-28 February. Part of the company’s expanded portfolio of water purification membranes, the Lewabrane RO B400 HP and Lewabrane RO B440 HP elements include enhanced brackish water processing capabilities for applications where high rejection and energy efficiency are important. With an average salt rejection of 99.7% (at 2,000 ppm NaCl; 15.5 bar/225 psi) and high permeability, Lewabrane HP membranes are a further development of the high cross-linked polyamide membrane which Lanxess launched in 2012. Thomas Duletzki takes over as head of Lanxess’s Mergers & Acquisitions group on 1 January 2019.